Join the National Academies of Sciences, Engineering, and Medicine for a webinar series on undergraduate data science education. Webinars will take place on Tuesdays from 3-4pm ET starting on September 12 and ending on November 14. See below for the list of dates and themes for each webinar. 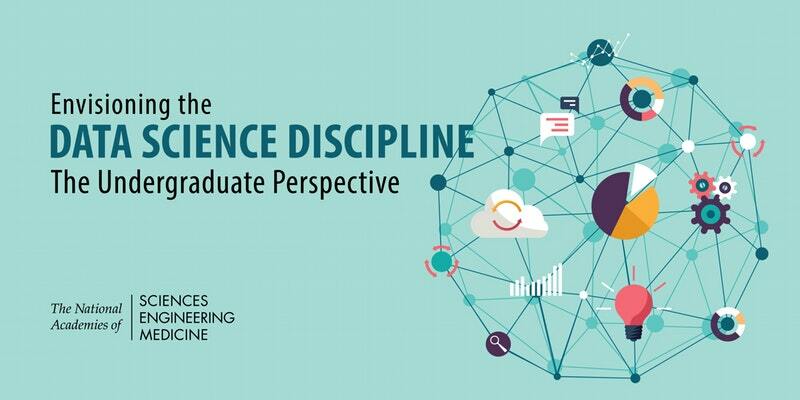 This webinar series is part of an input-gathering initiative for a National Academies study on Envisioning the Data Science Discipline: The Undergraduate Perspective. Learn more about the study, read the interim report, and share your thoughts with the committee on the study webpage at nas.edu/EnvisioningDS. Webinar speakers will be posted as they are confirmed on the webinar series website. All webinars take place from 3-4pm ET. You will have the option to register for the entire webinar series or for individual webinars.